Home Summer Camp Questions About Auditioning? Auditioning for our audition only Troupes is fun and painless, we promise! Here are the answers to your most frequently asked questions. Interested in auditioning for Commedia or Traveling Troupe? Register now. Do I have to register for auditions? Yes. And replying on Facebook doesn’t count. Register today and get lots of useful info (your parents will thank you for this). We recommend that you register for the High School Ensemble (or Middle School if you’re a current 8th grader) at the same time you register for the audition. That guarantees you a place in that ensemble, whether or not you’re accepted into the troupe. Later, if you’re accepted, we can change your registration. There is an audition fee of $60 ($50 with the Early Bird), which covers our staff and admin time. Do I need an audition slot? Nope. You’ll be in the audition room the whole time. We’re equally interested in how you play with others (and with whom you play particularly well) as we are in your audition piece. So plan to spend the whole time with us. Do I need to prepare anything for the audition? Yes. Traveling Troupe auditions require a Shakespearean monologue (min. 14 lines). Commedia Troupe kids need to prep a piece. 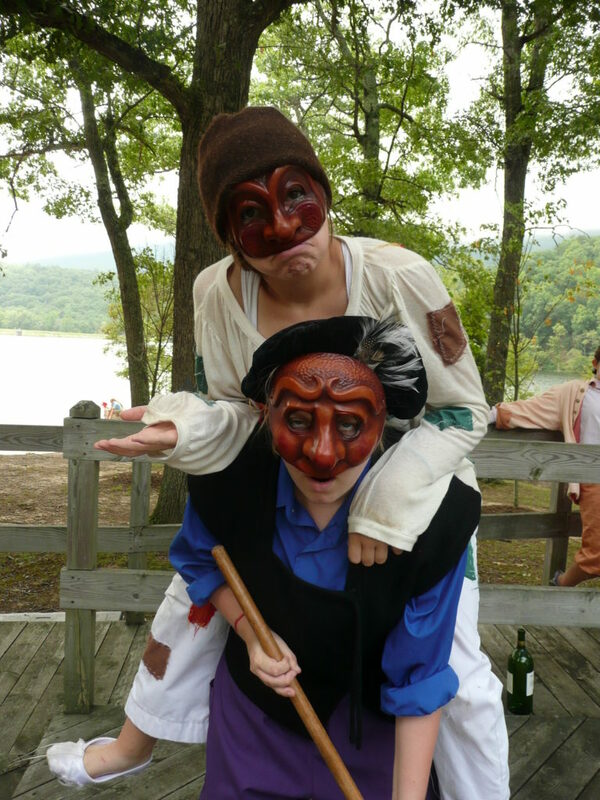 Learn more about Traveling Troupe Auditions & Commedia Troupe Auditions. Do I need to bring anything to the auditions? Bring a lunch/snack, a water bottle, and something to write with. You should also wear comfortable clothing that you can move in. Does it matter if I come to the January, February, or April auditions? Come to the January audition, if at all possible, since we begin to make some casting choices at that point. Nothing is actually set until after the second audition, though, so don’t sweat it if you can only come to the February audition. The April auditions are there for folks who find out about us late in the year. We can’t guarantee that there will be open spaces by then, so if you can audition earlier, do. Can I audition even if I don't know if I can participate this summer? No, sorry. While we understand that it can be hard to plan your summer, it’s impossible for us to cast actors who might not accept the parts. By coming to the audition, you’re making a commitment to the show and to the other ensemble members. I was in Troupe last year. Do I still need to audition? Yes. We select new actors each year. Usually, this means returning Troupe members will be re-accepted, but not always. Plus, for casting purposes, it’s important for us to see how you’ve grown or changed over the year: the audition isn’t just to determine if we’ll use you, but also how. We accept kids into the Troupes by considering the needs of the individuals and the needs of the play. We have to cast the plays with actors who are right for the roles. We also have to find roles that will challenge the individual actors, and sometimes we don’t take a brilliant actor because they stand to get a better part in the High School Ensemble. We also select people based on how they work in the group and what kind of energy they bring in. I'm interested in Commedia, but I love Shakespeare. What should I do? The best option would be to enroll in High School Ensemble, and audition for Commedia Troupe for second session. This will give you an incredible range of training in just one summer. Our Winter Shakespeare in Performance class is also a great way to do Shakespeare during the school year. We like to create a playful and supportive environment where returning TPE kids can reconnect with friends and newcomers to our community can be welcomed. Over the course of the audition, you will be given lots of opportunities to display your skills through improvisation, readings from scripts, and group discussions. We’ve been told that Troupe auditions are the most fun auditions our kids have ever attended. We intend to keep it that way. Can I audition for both Commedia and Traveling Troupe? Figure out which troupe you’d prefer, since we will take that into consideration. We genuinely care about what you’re interested in learning, particularly since the disciplines are so different. Audition for both in January. If you specify a preference, then the director of that ensemble has first dibs on you if they think you would do well in their play. If you have no preference, Toby and Jeanne will discuss how they would potentially use you in either production, and accept you into the Troupe with the greatest challenge for you as an actor (meaning the largest substantial role). The notification generally happens within two weeks after the audition. Students are accepted, declined, or deferred. A deferral is like a call back! Deferred students are asked to re-audition later when the director can see how the actor plays with other auditioners. (For example, if we’re considering you for the role of Romeo, but Juliet didn’t audition this round, we’ll need to check your chemistry during the next round of auditions.) Very few students are deferred: 1 to 3 every January.